When rainwater leaks into your property or flood damage invades your basement, just call the experts at 911 Restoration of Chicago and they will provide you with the emergency water removal services you need to make a full recovery. At 911 Restoration of Chicago, we understand how important it is to implement water and fire damage restoration as quickly as possible. By limiting the amount of time that moisture, fire, and smoke stays in your property, you can greatly limit the damage that is created. The basement flood repair unit stays available 24/7/365 and guarantees to arrive within 45 minutes of receiving your call, which is why we urge you to call us immediately upon discovering a flooded basement t in your home or business. The entire restoration company works with IICRC certified technicians who are licensed, bonded and insured to implement all types of fire damage restoration, mold removal, and water damage services. Call the water damage repair workers today and they will provide property owners with a free visual inspection of your home or business as soon as we get onto the scene. Despite how overwhelming a house flood can feel in the moment, once technicians arrive at your property the Chicago experts will reassure you that they will take care of everything involved in the water restoration process, from mold removal to filing your insurance claim. From the moment you hire our team, you can let go of responsibility and trust that the water damage restoration workers will do everything needed to put your property back together again. We know exactly what needs to be done when a flood or a leak impacts your home or business. 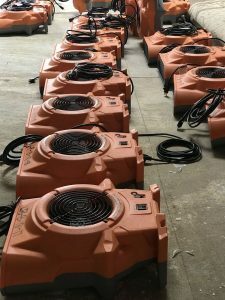 The water damage restoration team will use high-end gear to dry out your basement after a flood. 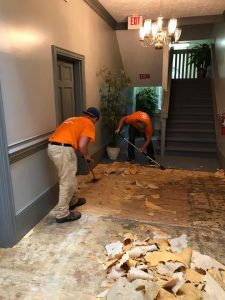 So, when you find yourself knee-deep in floodwater, just call the water damage restoration professionals and they will turn your flooded basement into a fresh start! During the winter the temperature can drop well below freezing, which can have a devastating effect on your plumbing system and, in turn, your property. If the pipes in your property are not maintained correctly before the cold front arrives, then you may be susceptible to experiencing water damage in your home or business. Cold spikes can cause pipes to freeze and if there is any water in those pipes then the moisture will expand and create a pipe burst, causing substantial water damage and even mold growth inside the property. Along with water damage, you may find yourself dealing with a flooded basement. Frozen pipes are one of the leading causes of basement water damage, but, fortunately, the technicians at 911 Restoration of Chicago are experts at implementing basement flooding repair services. If you need flood cleanup services for your flooded basement or discover frozen pipes in your home or business, call the water damage restoration team and they will dry out your basement after a flood. The mold removal professionals understand that if a heavy storm hits your neighborhood it may expose faults in your roof that you never knew were there, causing a mold infestation. Even if you get your roof properly inspected and maintained, the mold removal team knows that it is still possible for a crack to cause moisture in your property that may lead to mold growth when you least expect them. As frustrating as this can be, you can count on the mold removal specialists to find every trace of water and mold in your home or business and promptly decontaminate the area. The mold removal techs will do whatever it takes to repair any water damage and get your property dry, to ensure that mold does not re-infest the area. So, call 911 Restoration of Chicago the moment you find water leaking into your property and their mold removal pros will go the extra mile to stop a mold infestation from forming in your home or business. After you have experienced a sewage spill in your property, whether it was caused by a storm, pipe burst, or plumbing leak, you should call the sewage cleanup team so they can implement same-day decontamination services. The sewage cleanup workers know that black water, also known as sewage, is filled with toxins that can be harmful to your health. Which is why they urge you to stay away from the raw sewage and call them to implement sewer flood cleanup procedures. Keeping you safe and healthy is our top priority, which is why it is necessary that the sewage cleanup members use advanced water extraction and drying machinery to get every drop of black water out of your home or business. By quickly removing the black water, the sewage cleanup techs will limit the disruption of your living conditions and move quickly to get your property back to normal. By working meticulously they will also prevent your need for mold removal services. The sewage cleanup experts use comprehensive remediation techniques to get your property back into pristine condition, so call the Chicago professionals today! Your safety is the most important aspect of any fire damage restoration job, which is why you should always consult with the fire department to make sure your property is safe to reenter before calling 911 Restoration of Chicago. After the flames have been extinguished, you should contact the restoration professionals, so they can begin cleaning up all the fire, smoke, and ash damage. When the experts arrive on the scene, they will address flame damage, smoke stains, smoke odor, ash residue, and even the water damage created by the fire hoses. Most home and business owners aren’t prepared for the amount of water damage that the property incurs from the fire extinguishers, but our technicians are trained to handle every aspect of a fire damage restoration job. 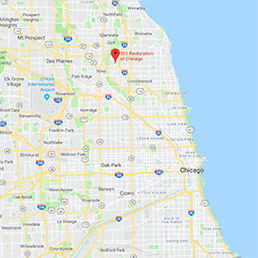 So, call 911 Restoration of Chicago for comprehensive fire damage restoration services and their experts will fully restore your home or business, leaving you with a property both safe and clean for you and your family. 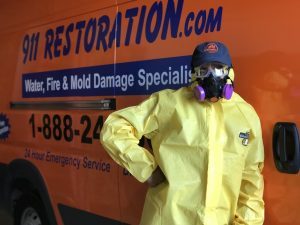 In an effort to ease your mind about the financial side of the project, the disaster restoration crew consistently offers affordable prices on all of their mold removal, water, and fire damage restoration services. On top of keeping low prices, the fire damage restoration unit also work with all insurance companies. The disaster cleanup operation wants to keep your out-of-pocket expenses down, which is why we work with all types of insurance providers. If you aren’t sure if your policy covers the damage caused by the disaster that impacted your property, you can rely on 911 Restoration of Chicago to file your claim for you. The disaster restoration techs have been working with insurance providers for many years, so our experts know exactly what information to provide to get you the maximum amount of coverage you are owed. Call the disaster restoration professionals when you need restoration services after any disaster impacts your home or business, and we will help you get the financial aid you deserve.